It's no lie you're making money in your business. Heck, you're profitable each month and even have a team to help you. And yes, 1 person + you = a team. But even though sales are coming in, your income has flatlined... You've noticed it for awhile and thought, "well, I'll see how next month shapes up." But next month was exactly the same. It's time for you to enjoy a worry-free weekend off from your business, double your revenue to pay yourself what you deserve, and live-in-the-moment of quality family time. You could be one of the ten business owners I work with to expand your offline business online and fill in and build out your complete sales funnel (aka online sales process) to get visible, get leads and get sales online! 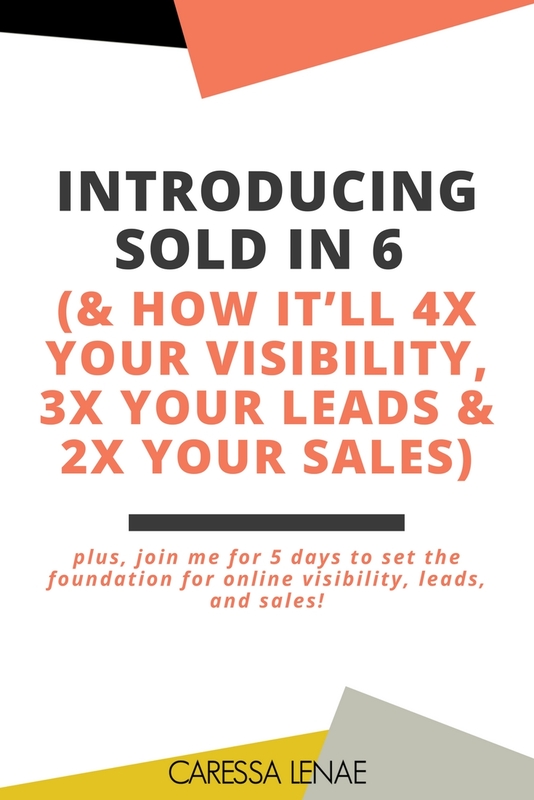 Sold in 6 is a 6-month group coaching program that gives you the strategy, the blueprint and the content you need to market your product online and potentially doubling your revenue at the same time. ++ BONUS opportunities that only those in the program will have the option to choose from! Our goal is to get your life looking —> You're relaxed and smiling while boarding the plane for a family vacation. You're confident your business will make sales without you physically being there. You're clicking champagne glasses with the 'who's-who' in your city because word around town is you've got the best to offer in your market. And since I know you're ready, click the link below to learn more and secure your spot to be one of the 10 who's going to be Sold in 6!